The gift-giving holidays are wrapping up (pun! ), the new year is approaching. What do you want is a common question for this season, and one that’s been on my mind. Stuff is easy, at least the smaller every-day items. I can purchase anything I truly want for myself. It was nice to have some Barnes and Noble gift cards on my account for a while; buying ebooks took less decision making, but truly, it doesn’t matter. If I want it, I can buy it. If I’m not sure I want it that much, I can investigate the options in the library. Stuff is hard if your goal is to have less of it. Acquisition is so much easier than decluttering. It’s the bigger questions of who I want to be and how I want to live my life that weigh more heavily. I’ve been reading the Power of Habit by Charles Duggin (I think I’ve read this before). It reminds me that when we are in major life transitions, those are the easiest times for our habits to change — for good or ill. So be mindful and pay attention to how you line yourself up. I hope to move into a more permanent residence this next year, and that’s one subject of my musings. I have learned that I would rather be out doing things, or even in doing things, but cleaning and yard work are not very high on the list of things I enjoy doing. I would like to minimize my investments here. A place that is easier to take care of, enough money left to pay for help, are ways to accomplish this. I can hire help where I am, but I am not so sure that I can find a lower maintenance place than what I had before. I also need to work on my habits, as mentioned above. I don’t have a good way to deal with all the paperwork that comes into my place through the mail; it stacks up. Finding a better habit and way with this would help. I am not awful with dishes (my current place does not have a dishwasher), though undoubtedly I could improve. I think my biggest problem is that there are many times when I get home, or on weekends, that I just collapse into a chair, doing nothing productive. Perhaps, as Duggin suggests, my willpower is worn out for the time being. Perhaps I need to work on my willpower muscle to grow some more. I don’t like those long unproductive stretches. I know I want to live in a place that has clean, uncluttered lines. Places to work that are ready for work when you need them. I want a certain Zen-chic, that leads towards peaceful thoughts and a peaceful mind. I am sure I will have to fight against even my tendencies towards acquisition and clutter. I am sure I need work on the paperwork demons. I hope I can use my transition to create better habits. As with the ε>0 exercise plan, one step at a time. I hope I am mindful and aware of what’s going so that I can actually decide what changes to make, rather than having them made for me by default. I get to the end of today, as with yesterday, as with previous days, and I am not sure at all what it is I have accomplished. It feels like I am swimming in circles in circles in circles in circles and getting nowhere at all. This isn’t quite true. I can tell you that yesterday I met with my colleagues in Computer Science and gathered intelligence about a course I am teaching and the graduate program I am involved in. It was nice to get an invitation to a party (a social party!) from one person I talked to. Today I went through training so that I can maintain and create my own university website and have it be integrated into the system the university uses. I put up some content, although not a lot. I ordered a tablet and a back-up drive for my computer, and while doing so I just boggled at the amount of time it took to look over reviews and specs. I even found them for a much lower price, but it turns out we can only order from the one place, so I might as well have not bothered with that. Grump. I have syllabi started for both courses I am teaching, but neither is finished, and nothing ready for first classes or first assignments. Swimming. In circles. In circles. In circles. The trick to getting big amorphous projects done is to break them down into smaller, concrete tasks, and then tackle the smaller, concrete tasks. To figure out a measurable outcome and to aim for that consistently. I know that’s where I’m not succeeding. It would be smarter to spend a half hour either once a week or even every day laying out the “what I want to get done” in small tasks, rather than flailing around at one thing then at another without much of a plan. It would also be good to turn the social media off so that I cannot get side tracked by “you’ve got mail” or another notification from Facebook. Or turn it aside for a while. While I don’t feel all that small, it is still the right thought. I will try again tomorrow. On the advice of a friend, I recently read Essentialism by Greg McKeown. It’s a book on a common theme: getting more out of life, getting more out of less. The type of advice your average overscheduled, over busy, overly responsible person needs, and that certainly includes me. One point made is to get enough sleep. Sleep allows us to function at our best. One point made is that we have to protect our ability to prioritize. And getting enough sleep is a big part of this. Guess what I’ve been failing at in the worst possible way since reading the book? I hope I have some other priorities in order. Some. Certainly not all. This is definitely a work in progress, and I hope I get better at it. I realize that a year ago was the break-up, the awful interview, the approval of instructional titles in my current department, and, when the handling of that was so badly botched in the Fall, the beginning of my journey to a tenure-track position. I feel a lot of melancholy. It has been a hard year. Things fell apart, but then something else seemed to come together for me. I had such hopes for a good career where I am. And then things fell apart again, putting my feet on this path. I have been terrified and sad and alone so much of this year. Chin up. Moving forward. Trying to keep a smile on my face, but sometimes far from succeeding. Things come together, and they fall apart. This has been a year of both. I hope next year will be coming together. But I fear the next falling apart, whether it is next year or further off. How much more can I take? As much as I need to. That’s how much. It is time to start moving forward on a number of things. I have gotten moving. And I’ve gotten sick, which has me temporarily stalled out. Every stall scares me a little, but I know that big scary things just get done. They get done one step at a time. All you have to do is keep stumbling toward your goal. In the midst of all this, I find myself wasting time with a game, 2048: http://gabrielecirulli.github.io/2048/. It’s nicely mathematical, and you think I’d figure it out easily, but as much time as I waste, here too, I am still struggling. I have made the 1024 tile. Persistence. Persistence. If I make 2048 once, am I done? Can I quit? I am sad to be leaving what has been my home for 12 years now. I am eager for new friends and new opportunities. I am scared of the challenges that lay ahead of me. I am excited to see what new things I will do. Tonight I am home from interview #3. The best part of interview 3 was a brief visit with some faculty from another school in the area that are interested in me. I liked them; they were kind and helpful and welcoming. The school I interviewed at had a number of people talk to me about collegiality. Yet they didn’t join me for breakfast or for dinner. Yet they didn’t have me sit with any faculty one-on-one to discuss life in the department or the possibility of collaborating on projects. I don’t think I talked to any other regular faculty without an administrator present. That didn’t sit right with me. They also have a big emphasis on going to a project-based educational model. In baby steps. Baby steps are right for an emphasis like that. I’ve taught projects and mentored projects and developed projects. They take a ton of time. Developing a campus-wide initiative to incorporate projects in every course across the curriculum is going to take some serious faculty time. They have a high teaching load, and “for reasons of fairness”, they do not give course releases except for faculty with grants. I agree that course releases can be distributed unfairly, but developing projects can be a serious drain on faculty time and energy. Some will put a lot of energy and time into developing materials, and they should be rewarded for this. 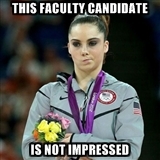 It shouldn’t be an unfunded mandate for the faculty to somehow provide. Then, late today, I had a phone interview with yet another school. One aspect of the conversation is the tenure and promotion criteria, and how does what I do fit in with what they want? They are interested in my application for the work I do with undergraduates, they want to promote this, yet it is not really part of what they consider for tenure and promotion! (Yes, you read that right.) Work with undergraduates seems to be counted as a part of teaching or service (where I already excel) rather than as a part of scholarship or research, which is where I want to make sure I have enough points. In fact, what they want for scholarship and research is, specifically, math publications in quality math journals. Nothing wrong with that, but that’s not my main direction. I’d grab it if it came my way, but that’s not what I have planned out for myself. I tried in every way to make it clear in my research statement that my research focus is on interdisciplinary projects that I can do with undergraduates. They specifically state that they want math publications. Since mine are interdisciplinary, this means they are likely not published in math journals, though mathematical in nature. Second, my real strength is in working with undergraduates and promoting undergraduate research, but they recommend I not do this for the first 2 or 3 years I am there to focus on my research publications (really?). Third, I write on on best practices in education, which is okay, in their book, but not the main thing they want to see. I’m pretty sure my writing was easy to understand, and it is not clear to me what went wrong here. I spelled out what I am all about. Why did you pick my application out of the pile? You win some and you lose some. My feeling is this school is also not for me. Tomorrow, or very soon, I will have to reply to their invitation to a campus interview. I am thinking not. I will leave the door open for them to come back and have a dialogue with me, but I don’t think I want to waste anyone’s money and time flying up for an interview with a department where I have serious questions about whether I’d get tenure. Monday I leave for my first tenure-track interview. My talk is mostly (?) prepared, and I will do a dry-run with some generous colleagues today. I still have to research the people I will be talking to; trying to find things in common, questions I want to ask them. I return Wednesday and leave Friday for my next interview. I leave Friday in order to visit friends on the weekend in the city where I am flying to. If I get in early enough on Sunday to my interview site, they are talking about taking me hiking. I like this bunch already. Interview Monday, and I return on a red-eye flight that night with the hopes of being back in time for class on Tuesday. That next weekend, I had arranged a reunion with some old friends, but now I have to fly out that Sunday. I think I can still do all, but there will be some juggle in there. That will be interview #3, and I will be flying back super-early Tuesday morning and hoping to make it back just in the nick of time for class. Whooooooo. It will be a trick to get everything done. In every case I have someone providing back-up should I not be able to make it back. And school #4 is getting more interested, so I bet I have another trip coming. I am a little scared walking into these next few weeks. Everything that must get done, will get done. One step at a time, one foot in front of the other. I can do this, I can do this. I can I can I can I can. At each one, I walk in as prepared as I can get with the attitude that I am the woman for the job. And with all my strongest characteristics shining through. In a small school you want to hire someone who will be personable and responsible. Pleasant to work with and who will pull their weight. And that’s who I am. I think. I hope. All I have to do is make it show. Some of you may already know that I put my credentials out on the tenure-track job market. Oh, not the Tier 1 Research University market — that’s definitely not my thing. I applied at liberal arts schools and master’s granting institutions where teaching is clearly highly valued. My ideal position would give me breathing room to do both teaching and research/scholarship. Let me do my thing teaching. Let me explore some ideas. Let me not be so overburdened that I am working every weekend and always freaking out. I wasn’t even sure I was tenure-track material. All those positions that required research statements. S-C-A-R-Y. I’d seen one of the graduate students’ research statements, and something like that wasn’t coming out of me. So I worked on the things I knew how to do. The CV. The teaching statement. So grateful to the advice I got on those. But the research statement. What I’ve gotten into I’ve gotten into through my teaching. Undergraduate research projects. I do undertake some collaborative projects, but that’s where they come from. There are some more papers on teaching that I’d like to write. I had one (now accepted) under review at the time. Could that possibly be good enough? I went out and searched the internet and I found Dr. Karen’s Rules of the Research Statement. One page long? That doesn’t sound so scary. I didn’t think I could get even my simple ideas in to one page. She said short. Maybe two pages. And give an overview. I can do that. The simple mathematical biology projects I work on, and my ideas for things I’d like to write got all put together. It ended up going onto a third page with the citations, but there it was. A research statement. I am so grateful for the mentoring I got; I was surprised to hear from that senior colleague that she thought I’d be competitive at the good liberal arts schools. Soon (days) after getting my first applications complete, I got my first request for a Skype (phone) interview. It’s been about a month and a half since I first put myself out there. I’ve done three Skype interviews. I have two more coming. Today I got invited for two site visits. Whoa. I’m excited and scared and intimidated and eager and afraid and mind blown! What am I going to talk about at the general audience 45-minute science talk where I can’t use calculus? How am I going to find time to prepare the talks and classes I’m going to have to do while interviewing? Who will teach my classes while I am gone? How to bring this up with the departmental administration that got me mad enough to apply elsewhere in the first place? Will I be able to negotiate a good starting salary; because I am not in a fresh out of school or fresh out of a postdoc position; I’ve got more behind me than that. After my last promotion I’m doing okay salary-wise where I am (not that I couldn’t do better). But some of that is tomorrow’s problem. Here I am. Success. Now we make the best of the next step and keep moving forward. I just got an informal acceptance notice for my article to PRIMUS! Backstory here and here. The small mistakes can be fixed, and I was tired, stressed, getting to the end of my rope, and grateful for some help from a very kind colleague and mentor with the final revisions on it. That minor issues were missed shouldn’t surprise anyone. Have an idea? Write it up and submit. Just try. And try not to worry that it won’t be good enough. Stuck on revisions? Little bits of effort, epsilons, can move you forward. Still struggling? Ask friends, colleagues, mentors for help. …but first thing tomorrow, I get to work on those last revisions and resubmit. I am grateful, grateful, grateful to see this through and for all the help and encouragement I got along the way.